A Detroit Lions fan says he was attacked by Eagles fans after Sunday's game. This story won’t do much to help the negative stereotypes held against Philadelphia fans. But the good Samaritan who pops up at the end should be a reminder that not all who cheer in the City of Brotherly Love fail to fulfill its name. A Detroit Lions fan who has lived in Philadelphia for two years says he was beaten unconscious Sunday while leaving Lincoln Financial Field after the Eagles defeated the Lions 34-20, according to Philly.com. The 33-year-old business owner and Michigan native — who spoke to Philly.com on the condition that he not be identified — said half a dozen Eagles fans hit him with snowballs and "other projectiles," and that they then punched and kicked him because he was wearing Lions gear. The man said he was treated for a concussion and minor injuries, and he was also checked for internal injuries. The man says he was attacked around 4:30 p.m. Sunday, claiming it started when a group of men began shouting and throwing snowballs at him as he walked to a train station to try to catch a ride home. "I tried to keep my head down and avoid them," he told Philly.com. "I didn’t want to give them the satisfaction." "I was like, ‘Are you guys serious? You won, enjoy it.’ "
"I felt like I was being choked and punched." Ultimately, he says he lost consciousness. When he came to, though, the man claims it was an Eagles fan who offered him help. He said that Eagles fan was so upset about what happened that he ripped off his jersey and threw it in a nearby trash can, according to Philly.com. Police said they were looking for surveillance video to help their investigation. "These despicable attacks on fans who are rooting for other teams is something we don’t take lightly, and we’re not going to tolerate it," Capt. Laurence Nodiff said, according to the report. The only reported description police have of the alleged attackers is that they were white men in their 20s wearing Eagles jerseys. 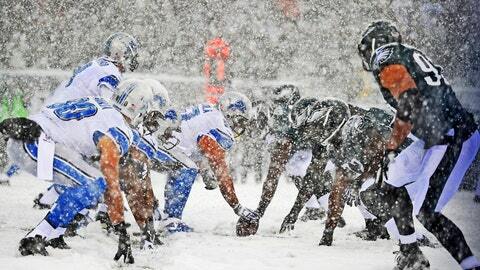 The Lions fan said he wore a Barry Sanders jersey to the game and was pelted with snowballs all afternoon. "I am a loyal fan," he said. "I travel all over for games, and my worst experiences are with people here in Philadelphia."